Please see [here] if you're looking for the current "Save the Train" home page. Please see [here] for the TransWilts site. returning at 06:18	09:02	12:02	15:02	17:55	and 18:45. 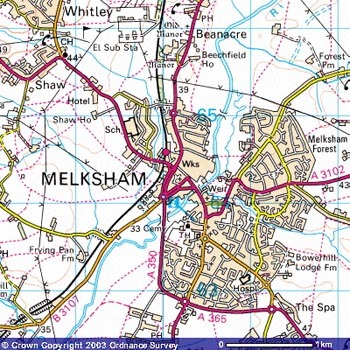 Melksham is about 100 miles to the West of London,served by the Swindon to Westbury / Salisbury / Southampton train service currently operated by Wessex Trains. At Swindon, all trains from Melksham connect into fast trains to London (Paddington); at Westbury, six routes come together and you can change into trains to Exeter, Plymouth and Penzance, to Newbury, Reading and London, to Bath and Bristol, to Salisbury, Southampton and Portsmouth, and to Yeovil and Weymouth. The station in Melksham is located across the river from the town centre, with an underpass for cyclists and walkers provided to help make a safe crossing of the busy A350 trunk road. Images produced from the Ordnance Survey Get-a-map service. Images reproduced with kind permission of Ordnance Survey and Ordnance Survey of Northern Ireland. Franchise map - who operates which service?